In a ruling Wednesday, Federal District Court Judge Michael Simon rejected the government's latest plan for protecting salmon in the Columbia River Basin, saying the system of fish-blocking dams "cries out for a new approach." 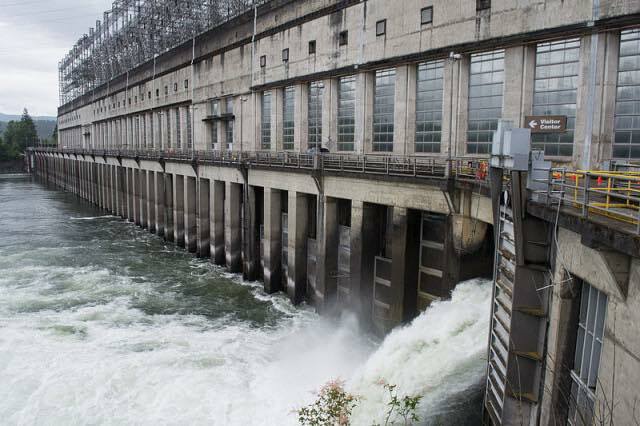 It's the fifth time a federal judge has ruled against the plan that guides dam operations on the Columbia and Snake rivers. The question of how to offset the impacts of hydroelectric dams on threatened and endangered salmon and steelhead has been subject to more than 20 years of legal conflict. Wednesday's ruling is a continuation of a lawsuit that was filed in 2001. "Basically this is strike five for the federal agencies," said Todd True, lead attorney with the challengers and EarthJustice. "I think this is a particularly comprehensive rejection of the way the agencies have been trying to avoid modifying the operation of those dams." Federal agencies that run the Columbia River hydropower system have repeatedly rewritten their salmon protection plan, known as a biological opinion or BiOp. The plan was reworked under the Clinton, Bush and Obama administrations, but each time it's been challenged and ultimately rejected in court. In a statement, the agencies said they will continue their efforts to protect and recover salmon and steelhead. "The U.S. government is disappointed that the court has not agreed with our approach in this long-standing litigation," the agencies wrote. "The decision will require time and effort to analyze and fully understand. We sincerely appreciate the region's unprecedented collaboration and commitment on behalf of salmon, and the important progress that it has produced." Terry Flores of Northwest River Partners, a group that includes utilities and river users who support the federal salmon plan, said the judge did his own "deep dive" analysis instead of deferring to the agencies that have the expertise. "Judge Simon did what we were fearful he would do," she said. "We're extremely disappointed and frustrated with the ruling today. I'm concerned it's really going to set this region back." Flores said the ruling raises questions about whether the Endangered Species Act is actually working, given the extensive effort and analysis that went into the latest plan. Conservation groups along with the state of Oregon and the Nez Perce Tribe challenged the 2014 biological opinion. Judge Simon found that plan violates the Endangered Species Act and the National Environmental Policy Act, so the U.S. Army Corps of Engineers, National Oceanic and Atmospheric Administration, U.S. Bureau of Reclamation and Bonneville Power Administration will have to write a new one. In his 149-page ruling, the judge called for a whole new environmental analysis of how dams affect salmon as well as a new plan by March 2018. He wrote that a new analysis that considers alternatives such as dam removal "may elucidate an approach that will finally move the listed species out of peril" and "break through any bureaucratic logjam that maintains the status quo." Flores said the judge is requiring "an impossible task" that will send the agencies "back to square one" and unravel years of collaboration among agencies, tribes and river users. Supporters of the 2014 plan said strong salmon returns in recent years prove the latest plan is working. But opponents said it doesn't do much more to protect salmon than previous plans already struck down by the courts. Simon's predecessor, federal judge James Redden, rejected the Obama administration's 2011 salmon plan. After announcing he would step down from presiding over the case, he said in an interview that the four dams on the lower Snake River should be removed as a way to help struggling salmon runs. He also supported spilling more water over dams and increasing water flows to help young salmon and steelhead migrate to the ocean. Simon did not call for the removal of the lower Snake River dams, but he did call on the agencies to try a new approach, noting that they have "ignored the admonishments of Judge (Malcolm) Marsh and Judge Redden to consider more aggressive changes … to save the imperiled listed species." Simon said the agencies have minimized their efforts to improve dam operations while putting most of their efforts to save salmon into habitat restoration. "Despite billions of dollars spent on these efforts, the listed species continue to be in a perilous state," he wrote. "The [Federal Columbia River Power System] remains a system that ‘cries out' for a new approach."